Ping Golf has been the "G Whiz" of club makers, given the company's history of success with its G2, G5, G10 and G15 lines. Well, Ping is now more than OK with K and the K15 Series of metal woods and a hybrid/iron set. The K15 Series is branded as a "super game improvement" line, which shows the confidence Ping has in the K15 Series. Ping says the K15's "Straight Flight" technology is achieved by concentrating more weight in the sole near the heel. This, says Ping, helps players rotate the club face to a more square impact position, which provides straighter shots. The larger head and face profiles of the driver and fairway woods results in higher MOI for greater forgiveness and increased ball speed. Price: The K15 driver sells for $337.50, fairway woods for $222.50 and the K15 iron/hybrid set for $136.25 per club (steel) and $155 (graphite). The Acushnet Company is spinning off its popular Vokey Design Spin Milled Wedges with the introduction of its WedgeWorks Exclusives line. Acushnet calls WedgeWorks "a high performance custom shop" where Master Craftsman Bob Vokey and his team design and build wedges for everyone from PGA Tour players to avid wedge enthusiasts. Each personalized creation ($150 each) is a one-of-a-kind that's custom-engraved as well as hand-stamped and built at WedgeWorks in Carlsbad, Calif.
We are not promoting gambling (mostly because we always seem to lose when we do). But we understand the juice that flows when some moolah is riding on a putt. So, we bring you GolfMoolah, a new iPhone app that acts as your bookie and scorekeeper. Here's how it works: Enter the names and handicaps of everyone in your foursome, and find the course where you're playing (many, but not all, courses are preloaded). Then pick your game; options include everything from classic Skins to Bingo, Bango, Bongo. Next, enter the amount wagered, and then back up your money with some good golf. As you keep score using GolfMoolah, the app keeps a running total of how much money you've earned (or lost) that round. So when you finally tap in that winning putt (we should be so lucky), you're presented with a list of who owes what to whom. Although Callaway Golf Company is all about metal woods, it has developed as one of its better products the X Series Jaws wedges. This makes sense since Callaway's chief wedge designer is Roger Cleveland, the original designer of Cleveland Golf wedges. The wedges were named "Jaws" by Callaway staff player Phil Mickelson because the club allows you to attack the pin with confidence. Now Callaway has a new variation called the X Series Jaws CC wedges ($119 steel, $139 graphite). 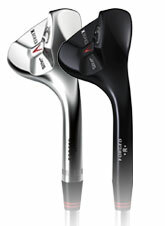 They feature the new Tour CC Grooves that produce enhanced spin. The C-Grind Sole and classic head design ensure versatility for the short game. The wedges are forged from 1020 carbon steel and have a slate finish. An interview with Roger Cleveland"
That's right, one of the more popular devices on the PGA Tour is one you don't see: the Bushnell Pro 1600 rangefinder. The rules prohibit players from using rangefinders in competition, but caddies use them, often before each round, to measure exact distances. You just point and click at the target, which can be a flag, bunker or tree. The Pro 1600 is addictive even for those who don't particularly like rangefinders. It's compact enough to fit in your golf bag and works much better (and more accurately) than any in-cart distance system. The Pro 1600 Slope Edition features an "inclinometer" that provides a compensated distance based upon the degree of incline or decline. That is, when you aim at an uphill or downhill target, the Pro 1600 with Slope adjusts the yardage reading for the angle and distance, to help with accurate club selection. Check out video of Bushnell's rangefinders. Tripp Davis: Impressive portfolio includes The Tribute Golf Links in The Colony, TX, which pays homage to great holes at St. Andrews, Turnberry, Royal Toon and other Scottish courses. John Harbottle III: Designed the highly rated Palouse Ridge Golf Club at Washington State University. Randy Heckenkemper: Forty-plus courses to his credit, including The Territory in Duncan, OK, and the TPC Scottsdale Champions Course. Tom Lehman: The 1996 British Open champion has quietly made an impact. Portfolio includes Raven Club at Three Peaks, Silverthorne, CO and Raven at Verrado, Buckeye, AZ. Lee Schmidt and Brian Curley: This dynamic duo designed 12 courses in association with Nick Faldo, Pete Dye and Annika Sorenstam at Mission Hills Resort in China, the world's largest golf club. Prolonged periods of high temperatures, excessive rainfall and high humidity have made life uncomfortable for golfers and golf courses alike. "The simple fact is the cool-season turfgrasses such as bentgrass, fescue, bluegrass, annual bluegrass (Poa annua) and others are stressed when temperatures climb and humidity is high," says Clark Throssell, Ph.D., director of research for the Golf Course Superintendents Association of America. "What makes the situation so dire this year are the high levels of extended heat and humidity, and the sizeable part of the country affected (Midwest, Mideast, Northeast and Mid-Atlantic)." Raising mowing heights of playing areas, especially greens. Alternating daily practices of mowing and rolling putting greens, with consideration to skipping a day. Forgoing double mowing, topdressing, verticutting or grooming greens. Watering to provide adequate soil moisture—but not over-watering as saturated soil will cause the turfgrass to decline rapidly. Hand watering as much as feasible. because the majors are all about etching names of present stars on silver trophies that also hold honored names from the past--Hagen, Hogan and Zaharias. Even locally, club records of past champions and course changes are cherished documents. Well, if you want history, here's history--in bite-size amounts. "Living History" is the free e-newsletter of The History Channel Club. Sign up, and three to four times weekly you'll receive nuggets about our nation's best--and worst--moments. Example: this e-newsletter about the building of the Hoover Dam. It's an epic story of the dam's conception, design and construction that shines a light on our country when America fought to lift itself out of the Great Depression. The Hoover Dam helped shape the West, but it also had a dark side. Historic photos, videos and fun quizzes come your way almost daily, so give "Living History" a try. In the movie Happy Gilmore, Happy (Adam Sandler) is an irreverent, go-against-the-grain golfer who has this running, hockey slap-shot golf swing. The swing could be easily dismissed as that of a hacker who's high--except it produces 400-yard drives! We laugh at this comedy because these Hollywood drives can't happen in real life...or can they? Well, we came upon this Internet clip called "Sport Science Happy Gilmore." In it, scientists experimented to see if the Happy Gilmore running-start swing could actually increase driving distance when compared to the standard standing swing. The test subject was none other than Padraig Harrington. First, he did normal swings and the driving distance was measured, and then he did his Happy swings with a running start. The results? See for yourself. For a more analytical look, check out Harrington doing Happy Gilmore in slow motion. OK, 2007 Masters champ Zach Johnson wears Dunning's Slim-Fit Polo. That's not why we do. Our reasons have less to do with what pros wear and more to do with touchy-feely stuff. Here's the thing: You know how you have lots of good golf shirts but find yourself reaching for a few special shirts more often than not? These are your "short-list" shirts that look good, feel really good and, strangely, seem to help you play good? Well, that's exactly what this Slim-Fit Polo has been to us since spring when it was released for online purchase. As the name suggests, Dunning's Slim-Fit Polos have an athletic fit with close-cut, vintage 60s-inspired tailoring that's a kick. The shirt is narrow in the shoulders and torso and has a mid-bicep sleeve length. The fabric is lightweight and can stretch, breathe, wick moisture, all that good stuff. Check out where to buy this Slim-Fit Polo.